The metamaterial, shown here, is made of paper and aluminum -- but its structure allows it to manipulate acoustic waves in several ways. Researchers from North Carolina State University and Duke University have developed a metamaterial made of paper and aluminum that can manipulate acoustic waves to more than double the resolution of acoustic imaging, focus acoustic waves, and control the angles at which sound passes through the metamaterial. Acoustic imaging tools are used in both medical diagnostics and in testing the structural integrity of everything from airplanes to bridges. “This metamaterial is something that we’ve known is theoretically possible, but no one had actually made it before,” says Yun Jing, an assistant professor of mechanical and aerospace engineering at NC State and corresponding author of a paper describing the work. Metamaterials are simply materials that have been engineered to exhibit properties that are not found in nature. In this case, the structural design of the metamaterial gives it qualities that make it a “hyperbolic” metamaterial. This means that it interacts with acoustic waves in two different ways. From one direction, the metamaterial exhibits a positive density and interacts with acoustic waves normally – just like air. But from a perpendicular direction, the metamaterial exhibits a negative density in terms of how it interacts with sound. This effectively makes acoustic waves bend at angles that are the exact opposite of what basic physics would tell you to expect. The practical effect of this is that the metamaterial has some very useful applications. For one thing, the metamaterial can be used to improve acoustic imaging. Traditionally, acoustic imaging could not achieve image resolution that was smaller than half of a sound’s wavelength. For example, an acoustic wave of 100 kilohertz (kHz), traveling through air, has a wavelength of 3.4 millimeters (mm) – so it couldn’t achieve image resolution smaller than 1.7 mm. The metamaterial can also focus acoustic waves, which makes it a flexible tool. Lastly, the metamaterial gives researchers more control over the angle at which acoustic waves can pass through it. Right now, the prototype metamaterial is approximately 30 centimeters square, and is effective for sounds between 1 and 2.5 kHz. “Our next steps are to make the structure much smaller, and to make it operate at higher frequencies,” Jing says. The paper, “Broadband Acoustic Hyperbolic Metamaterial,” was published online Dec. 16 in the journal Physical Review Letters. The paper was co-authored by Ni Sui of NC State and Yangbo Xie, Wenqi Wang and Steven Cummer of Duke. Abstract: In this Letter, we report on the design and experimental characterization of a broadband acoustic hyperbolic metamaterial. The proposed metamaterial consists of multiple arrays of clamped thin plates facing the y-direction and is shown to yield opposite signs of effective density in x- and y-directions below a certain cutoff frequency, therefore yielding a hyperbolic dispersion. Partial focusing and subwavelength imaging are experimentally demonstrated at frequencies between 1.0 kHz and 2.5 kHz. 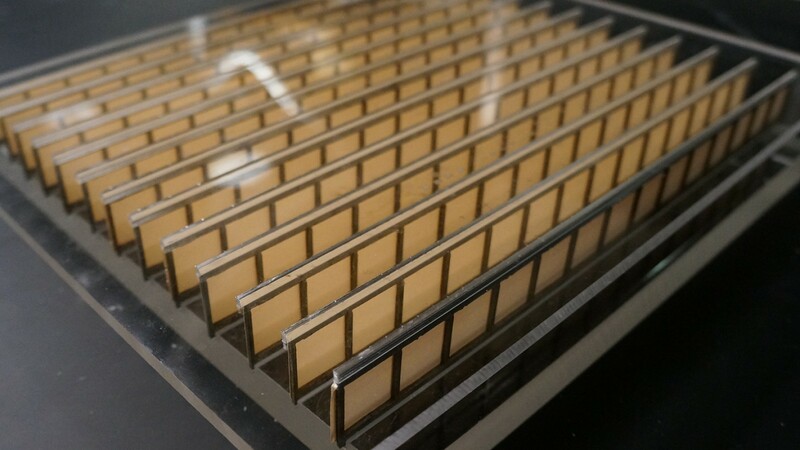 The proposed metamaterial could open up new possibilities for acoustic wave manipulation and may find usage in medical imaging and non-destructive testing.